Each pet is given a tailor made exercise program that slowly increases in intensity to continue to challenge your pet as they improve. The program includes both exercises to be done at home daily and exercises done during sessions here with our specialized rehab equipment. Our staff is trained to massage, stretch and perform specific techniques to relieve pain and improve flexability in joints and muscle groups. This is incorporated into exercise sessions. We have specialized equipment like our e-stim machine and laser therapy to help relieve pain and speed recovery. 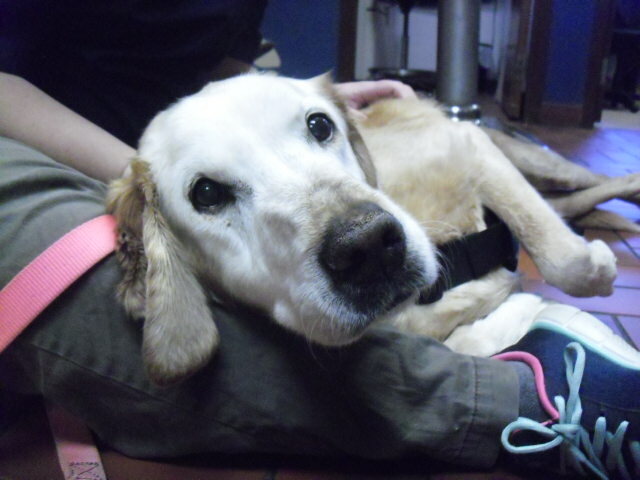 Pets with arthritis, neurologic disease or congenital problems with leg alignment may benefit from specialized braces. 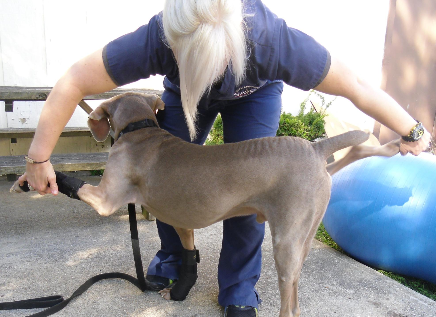 Our doctor can make splints or braces to help correct many of these problems or discuss other options to help your pet move more comfortably. Overweight pets can start an exercise plan that is targeted to their level of fitness to encourage weight loss and improve strength and endurance. We can also help canine athletes and working dogs come back to work after injury and discuss ways to prevent this in the future. 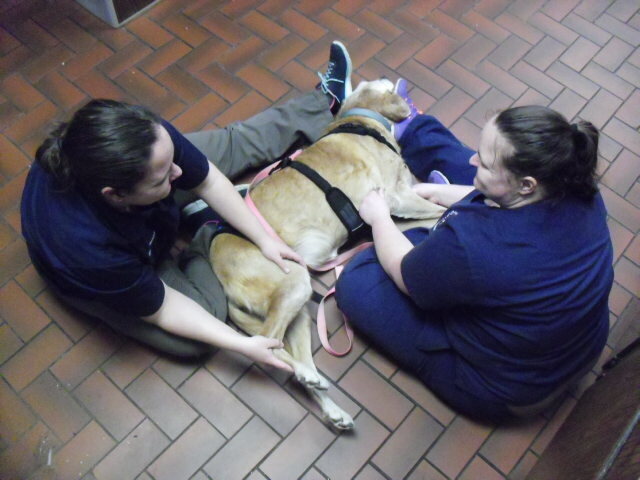 Our rehabilitation service is run by a veterinarian certified in canine rehabilitation. Rehab therapists receive additional training in normal anatomy, biomechanics, neurology and techniques to treat specific problems with these systems. 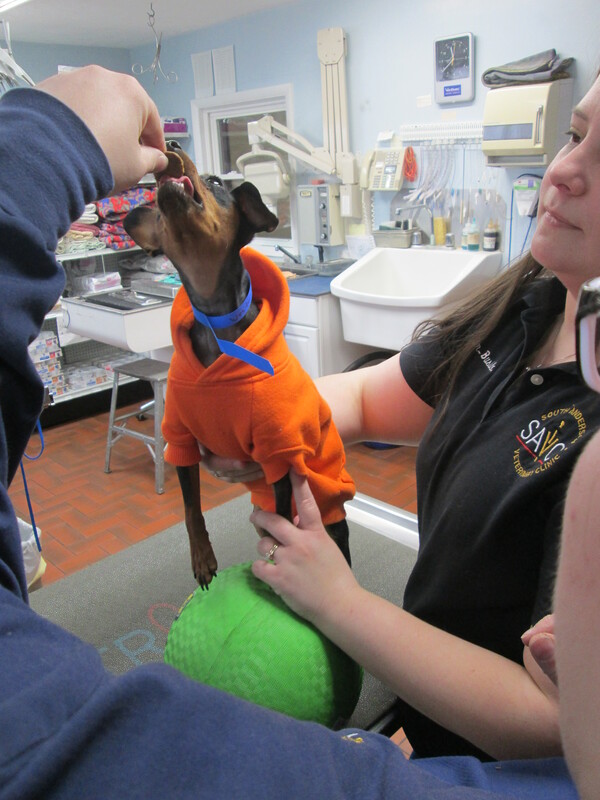 This specialized training allows us to pick up on more subtle changes in your pet and create an individualized program to help improve upon your pet's specific problems. Dr. Busick has over 7 years of experience working with pets in a rehab setting and can develop a plan specific to your goals for your pet. Owners interested in starting a rehab program for their pet need to set up an initial evaluation with Dr. Busick. During this evaluation we will determine the problem areas for your pet as well as a way to improve your pet's comfort and function. 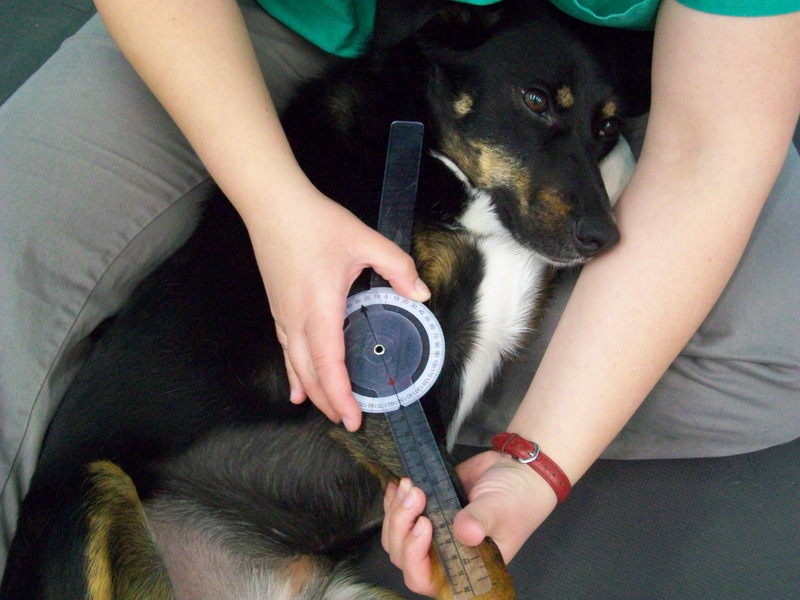 Most pets benefit from daily home exercise in combination with sessions done in clinic. We are happy to provide these services at our sister location South Anderson Veterinary Clinic. Please let us know if you would like more information on the location and services we provide.